The traditional Greenland Kayak or “Qajaq” has been essential to the survival of the Inuit of Greenland for thousands of years. Archaeologists found the remains of an Artic skinboat in West Greenland that dated some 4000 years ago.The “qajaq” was used for hunting seals,whales, walrus,fish,caribou,polar bears and birds; therefore it had to be swift, maneuverable and seaworthy. Unable to swim,the Inuit Hunter would seal himself into his boat to protect himself from the frigid water temperatures and relied on a vast repertoire of rolls to keep himself upright in the unpredictable situations that hunting large prey in rough seas presented. 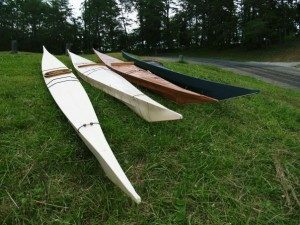 Skin-on-Frame kayaks are still used by the Inuits today and the growing popularity of these boats is now evident in Europe and along the Northeast and Northwest coasts of the United States. These fast, elegant and durable sea kayaks are ideal for paddling on the numerous lakes and rivers surrounding the Louisville area as well as on the Atlantic or Pacific ocean. The present day kayak owes much to the traditional Greenland skinboat. As early as the 1700′s, European explorers became infatuated with the Greenland kayak and frequently confiscated both the Inuit and his boat for exhibition, entertained by their amazing rolls. Fortunately, we’ve evolved since then!